Taliesin is a rich habitat for many species of wildlife. Some, like these Painted Ladies, are happy to share the space with visitors but others such as foxes and owls are a little more reclusive. All planting and land management at Taliesin is done with wildlife diversity in mind, and the focus on native species, along with the Orchard and Wild Harvest Project, will help to increase the number of species who can find a home (or a meal) here. We have done some work to enhance and extend wetland areas. 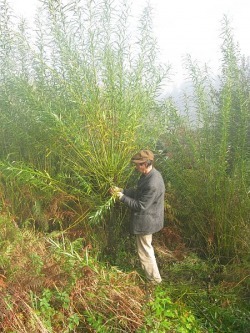 This willow was being gathered to make panels for the walls of the compost loo. Taliesin willow is also used by local willow workers and frequently finds itself being used for some purpose or other at the courses. Geologically, Taliesin is mainly composed of glacial rubble in a valley bottom. 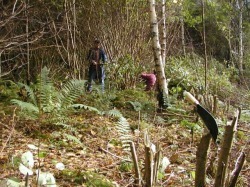 We have very good relations with the Forestry Commission who manage the public forests adjoining Taliesin on three sides, and have entered co-operative restoration of disused hazel coppicing on Potterland Hill which has been recognised as a Plantation on Ancient Woodland Site (PAWS) undergoing transition towards native mixed woodland. 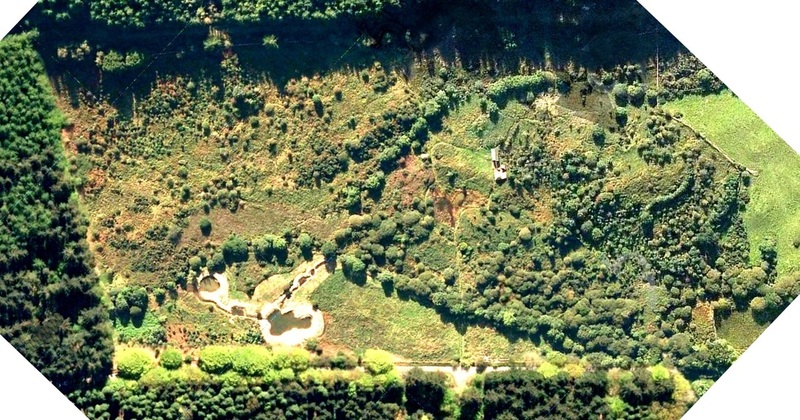 We also keep abreast of the Forestry Commission's management plans and activities in the area such as Felling plans (as of 2008), Re-stocking/planting plans (as of 2008), upcoming operations and the areas involved. NEW: Draft Management Plan for Potterland for discussion and comment.